If you work from home like I do, you probably have to face the similar issue of getting caught up in work and not going out for fresh air on a regular basis. Then there is the question of actually getting your blood flowing with some exercise. While I realize that this does not apply to all work from home people, I am pretty sure that there are those who are in the same boat. This product caught my eye as I was doing my daily rounds, as it provides the opportunity to get some exercise while working. Call it laziness. Call it multitasking. I think it’s the perfect chance to make the most of your time! The FitDesk PRO is actually just an attachment which you can fit into your existing bike. 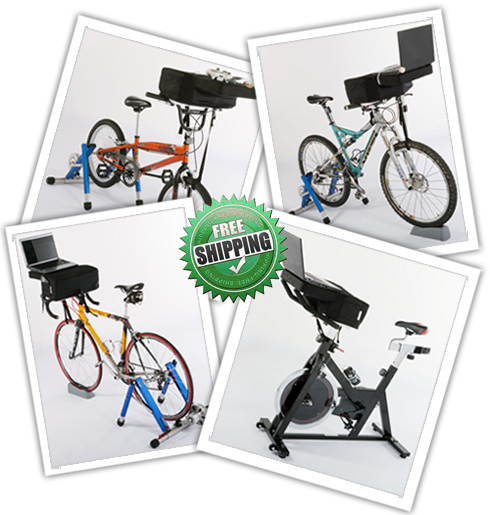 Whether you are a cyclist who has his own road or mountain bike, or you have an exercise bike which you do not have time to use, the FitDesk PRO can serve as your go-to exercise and work machine. The attachment is compatible with most bike handles, ensuring that you do not have to buy a new bike to use. Check out the FitDesk PRO in action. While I love the idea of having something like this, there is of course the issue of space if you live in a tiny condo or apartment. There is also the question of the price, as the FitDesk PRO does not come cheap. Its regular price is a whopping $129.99, and the discounted price is still considerable at $79.95. Also, you have to remember that this is just the attachment – you still need your own bike! Still, if you have the money, and you really need some exercise indoors while churning out your daily writing work, then this might be the solution that you have been looking for.